A few days elapsed after the receipt of your letter of September 18th before I could write to the Walters Gallery regarding your desire for photographs of the Byzantine book.The “Imperial” Menologion (W.521), Walters Art Museum, an eleventh-century illuminated collection of saints lives for the month on January that Henry Walters acquired in 1930. See Georgi R. Parpulov, “A Catalogue of the Greek Manuscripts at the Walters Art Museum,” The Journal of the Walters Art Museum 62 (2004): 83–88. Selections of the manuscript are available as a digital facsimile at http://issuu.com/the-walters-art-museum/docs/w521 (accessed September 9, 2015). I am sending you now the reply which I found on my return from New York yesterday. I have answered this letter, saying that I am communicating with you with the request that you indicate just what you desire photographed from the manuscript in the collection. So will you let me know your desiderata, and I shall at once communicate them to Miss Miner.Dorothy Miner (1904–1973), medievalist curator of manuscripts at the Walters Art Museum, Baltimore, beginning in 1934. See “Miner, Dorothy E[ugenia],” Dictionary of Art Historians, http://www.dictionaryofarthistorians.org/minerd.htm (accessed September 9, 2015). I read with much interest and satisfaction the review of your Volume IIL’art byzantin. in the Literary Supplement of “The Times”.Alan Francis Clutton-Brock, “L’Art Byzantin. Par Hayford Peirce et Royall Tyler. Tome II. (Paris: Librairie de France. ),” The Times Literary Supplement, September 6, 1934. I am sure your were pleased, as both Mildred and I are, to have a just recognition of the great work you and Hayford have done, though I wish the article had been a little more exhaustive in its scope. 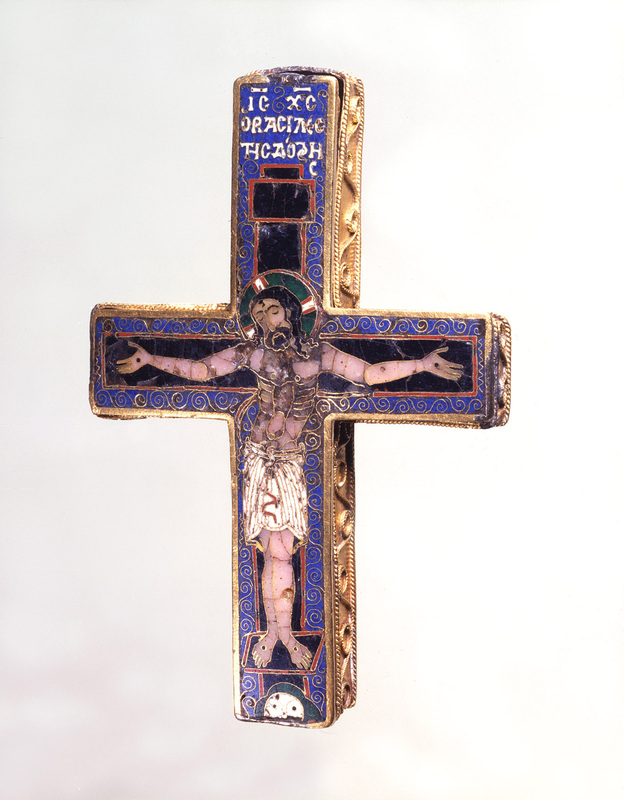 What you write in your letter of September 25th regarding the Goldene TafelCrucifixion icon, Byzantine, first half of the twelfth century, gold and enamel, 24.3 cm x 17.5 cm x 0.1 cm, 430 gr., Reiche Kapelle, Schloss Nymphenburg, Munich. See Reinhold Baumstark, ed., Rom und Byzanz: Schatzkammerstücke aus bayerischen Sammlungen (Munich: Hirmer for Bayerisches Nationalmuseum, 1998), 44, no. 30. is quite exciting, but also quire prohibitive, I fear, for us. We might possibly, under 1929 conditions, have considered it at about half the price you mention, but as it is, I fear there is nothing doing. However, if you hear anything more on the subject that you think encouraging, you might let us know. Day before yesterday I stopped in at Drey’sThe firm of A. S. Drey was founded in Munich in the 1860s by Aaron S. Drey. The firm later expanded to London and New York. In New York, Aaron Drey’s grandson, Paul Drey (1885–1953), was a senior partner of the Paul Drey Gallery, founded in 1920. in New York and found that he has the BurnsWalter Spencer Morgan Burns (1891–1929), a British art collector and financier, was a nephew of J. Pierpont Morgan and a partner in his firm, J. P. Morgan and Co., as of December 31, 1897. crossBZ.1936.20. At this time, the reliquary cross was owned by Ruth Evelyn Cavendish-Bentinck Burns, the widow of Walter Spencer Morgan Burns. with him in Europe. His secretary is writing him that I would like to see it if he will bring it back with him when he returns to America. And that’s that.